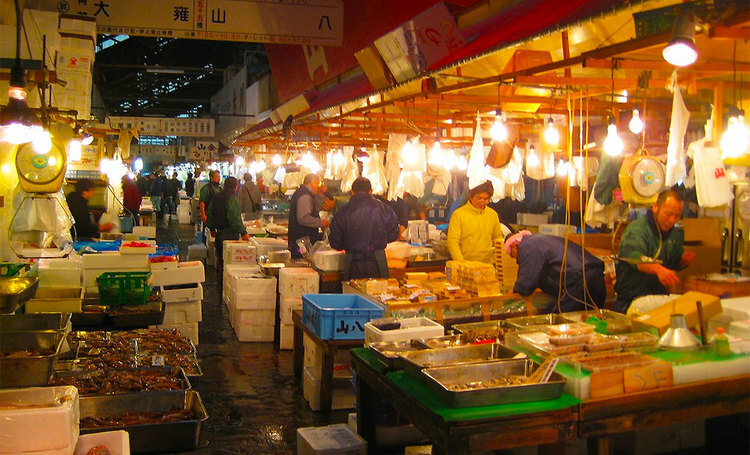 The Tsukiji Fish Market is the biggest wholesale fish and seafood market in the world, and also one of the largest wholesale food markets of any kind. The wholesale stalls are set up to sell directly to retail shops, restaurants and other businesses. The undoubted king of the market is the giant tuna, which on the first auction day of 2013, recorded a 155 million yen, or over 1.2 million US dollars for a massive 222kg Bluefin tuna. You can watch the auctions from a visitor gallery between 5:25am to 6:15am on a first come, first served basis. 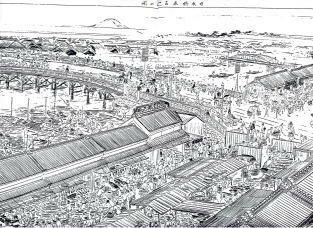 The predecessor of the Tsukiji Fish Market was established by Tokugawa Ieyasu during the Edo period, to provide food for the Castle of Edo. Tokugawa Ieyasu invited fishermen from Osaka to Edo to provide seafood for the Castle. Fish not bought by the castle was sold near Nihonbashi Bridge, at a market called Uogashi, literally meaning “fish quay”, or stone boat landing. The Great Kantō Earthquake in 1923 devastated much of central Tokyo, including the Nihonbashi Fish Market. 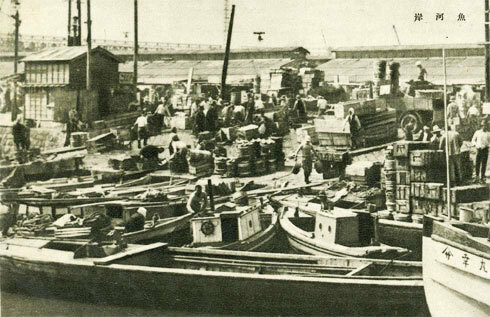 In the aftermath of the Earthquake, the market was relocated to the Tsukiji district and, after the construction of a modern market facility was completed in 1935, the Tsukiji Fish Market began operations. If you want to visit the tuna auction, you can watch from a visitors gallery between 5:25am and 6:15am free of charge. Visitors are currently limited to 120 people each day on a first come, first served basis. You’ll have to line up first at the Fish Information Center by the market’s Kachidoki-mon gate. The first 60 people may visit the auction at 5:25am, and the second 60 at 5:50am.